We only the carry top-quality suppliers and products for electrical needs in all jobs; commercial, industrial and government alike. As a member of the Imark Group, a member owned marketing group, we are afforded the ability to purchase quality products at competitive pricing from the electrical industry's leading manufacturers. Customers have the ability to call our on-staff professionals to discuss job needs relative to pricing, deliveries, collections or other issue and not a store employee, which leads to better job results. 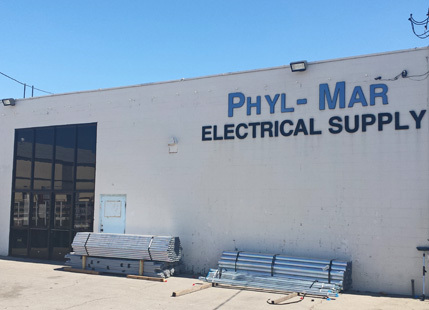 With big-box retailers located within a half-mile radius, Phyl-Mar Electrical Supply Corp. has managed to maintain a successful and active business for twenty-five years. Phyl-Mar, located in Canyon Country, CA is a full-line distribution company that specialize in the construction industry. We carry the latest in name brand products from the solar ready service panels, to LED lighting and more. We can service all of your electrical supply needs with name brand and latest labor saving products. We proudly carry “Made in America” products where possible.